Over the past decade and a half, countries around the world have taken unprecedented steps to shift their energy dependence from fossil fuels to alternative resources. Tariffs and subsidies have spurred the growth of wind and solar, regional emissions markets have imposed costs on carbon, and government funds have poured in to support the development of new, low-carbon technologies. And yet carbon emissions from the energy sector continue to rise. From 1991 to 2010, they grew at a rate of 1.7 percent a year; over the following decade, that rate nearly doubled, to 3.1 percent a year, according to data from the Intergovernmental Panel on Climate Change (IPCC). Notwithstanding a minor drop in emissions during the economic recession of 2009, the upward trajectory continues today. The energy supply sector -- which spans the extraction, transportation and conversion of fuel into energy -- is the largest single contributor to human-caused global warming, at around 35 percent of the total carbon budget. If the world hopes to head off potentially dangerous temperature rises of above 2 degrees Celsius, emissions from the sector will have to be sharply curtailed by midcentury, scientists say. "A mix of low-carbon energy from renewables, nuclear, or fossil fuels with carbon capture and storage [CCS] are going to need to grow to 80 percent of the electricity supply by 2050," said Ryan Wiser, a research scientist at the Lawrence Berkeley National Laboratory and a lead author of the energy supply chapter of the IPCC's recent Working Group III report. "Simply executing or expanding existing incentive policies isn't going to cut it. Business as usual absolutely isn't going to cut it. What's required is a true transformation of our energy systems," he said. By 2070, the world will need to phase fossil fuels out of its energy supply mix entirely, he added. The options for carbon-free energy are broad. Nuclear power already provides about 12.3 percent of the world's electricity and accounts for two-thirds of the carbon-free power in the European Union. Wind and solar, while less established, are advancing quickly in terms of cost-competitiveness and price maturity. And energy efficiency measures work equally well along the opposite track, lowering emissions by reducing the energy consumed. But not all of these options are advancing in tandem. As a share of global energy supply, nuclear power has actually contracted since 1993, and not just because of high-profile setbacks like the Fukushima Daiichi disaster in Japan. "The major roadblocks to expanding nuclear power have been more or less the same for a long time -- the cost of large, capital-intensive plants, the question of waste management and worries about proliferation," said Neil Strachan, a professor of energy and economic modeling at University College London and a co-author of the Working Group III report. The growth of renewables, on the other hand, has been a cause for optimism, Strachan said. 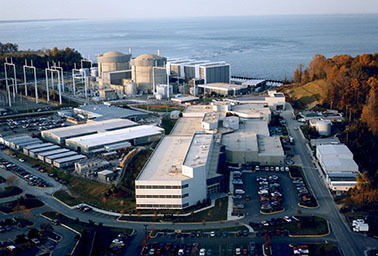 Calvert Cliffs nuclear power plant in southern Maryland. Will there be a next generation of nuclear power in the United States? Photo courtesy of the Nuclear Regulatory Commission. Since the IPCC's fourth assessment report was released seven years ago, many renewable energy technologies "have substantially advanced in terms of performance and cost," the Working Group III report notes. "[A] growing number of [renewable energy] technologies have achieved a level of technical and economic maturity to enable deployment at significant scale." While governmental policies still carry renewables to a large extent, there have been times and places in recent years when renewables could hold their own against fossil fuels unaided by tariffs or subsidies. And for the rest, lower costs mean that dependence on policy is lessening, the authors said. Meanwhile, new technologies like coupled bioenergy and CCS have drawn significant attention for their potential to both provide carbon-free energy and sequester emissions from the atmosphere (ClimateWire, April 3). But the expansion of low-carbon energy has come amid an upsurge in the world's appetite for energy. Coal continues to increase its presence in electricity generation, primarily in developing countries. For that trend to be reversed will require a departure from past trends, said Strachan. "The past is a limited guide to the future," he said. "The size of the challenge, the depth of emissions mitigation required means that we can't rely just on carrying our past successes forward." "Right now, we're running a 5K," he added. "We need to be training for the marathon."